Earlier in previous post, We have learnt how to set test execution priority of WebDriver test cases If you have multiple tests In same class. TestNG has one more very useful feature of setting test execution dependency. Dependency means If one @Test method fails or skipped from execution then It's dependent @Test method must not be executed. 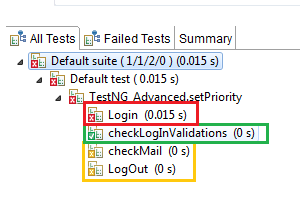 Supposing you are testing online email application using selenium WebDriver and you have two @Test methods In your class : 1) For LogIn and 2) For Check Mail. Now due to the some reasons (Invalid credentials), LogIn @Test method fails. In this case you not need to execute Check Mail @Test method because how can you check emails without LogIn In email application? In this case, You can use dependsOnMethods with @Test annotation of Check Mail method to skip Its execution. I have created simple example as bellow to demonstrate how It works. //This Is Independent method so It will be executed. //Bellow give assertion will fail to fail Login() method Intentionally. //This method Is depends on Login method. //This method's execution will be skipped from execution because Login() method will fail. //This method Is depends on Login and checkMail methods. TestNg result will looks like bellow. LogIn() method Is failed because we have written wrong condition In assertion. checkMail() and LogOut() methods are skipped from execution because they are depends on LogIn() method which Is failed. checkLogInValidations() method will be executed because It Is Independent. So this way, We can set dependency on @Test methods to skip Its execution If It's depends on method fails.